Healthy and delicious, this vegan stir fry with quinoa is loaded with seasonal vegetables and fresh flavors. With simple ingredients, and ready in just under 30 mins, this recipe is a sure keeper and “repeater”! Vegetable stir fry is a convenient and healthy one-bowl weekday meal. I love the flexibility it offers — one grain, lots of vegetables, and simple seasoning. They are so convenient that I make a vegetable stir fry with different grains for at least one or two meals every week! You can see my weekly meal plans here. Last week I made a big pan of quinoa stir fry for dinner and for a planned leftovers lunch. In this recipe, I’ve used carrots, onions, red, and green capsicum (bell peppers) and lots of fresh parsley. I love the vibrant colors and the mix of soft and crunchy vegetables. I’ve also used a mix of red, black, and white quinoa. They not only add more color to the stir fry, each variety of quinoa also adds a different texture to the dish. White quinoa cooks soft; red and black quinoa hold their shapes better after being cooked and also add a bit earthy and sweet flavor to it. 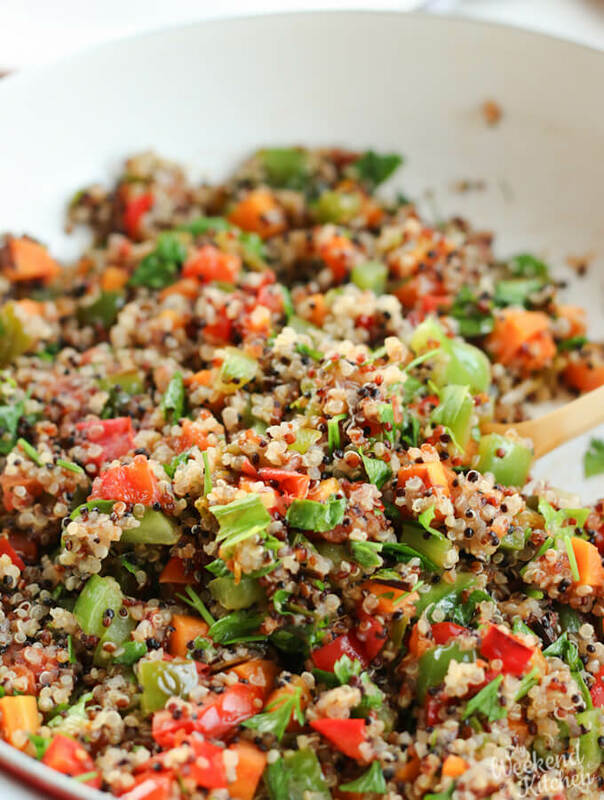 healthy, hearty, and colorful quinoa vegetable stir fry is an easy weekday meal idea! When you sauté vegetables in the pan, make sure to use a big enough pan that allows space for the vegetables to cook and then mix easily with the cooked quinoa. 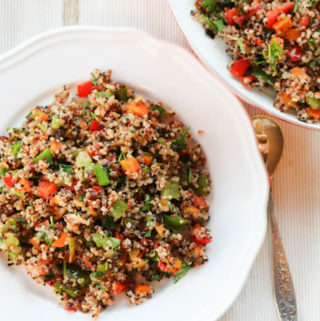 Quinoa is a particularly healthy grain for making vegetable stir fry and the salad recipes. Unlike rice and other grains, quinoa is often used in vegetarian and vegan meal plans especially because of its high protein content. It is also a complete protein meaning quinoa has all the 9 essential amino acids. It is a whole-grain carbohydrate providing high energy with low fat content. 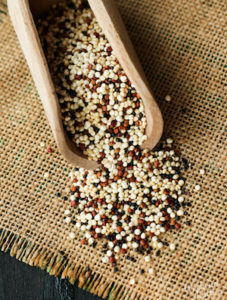 Quinoa also provides many key vitamins and minerals like magnesium and vitamin B. 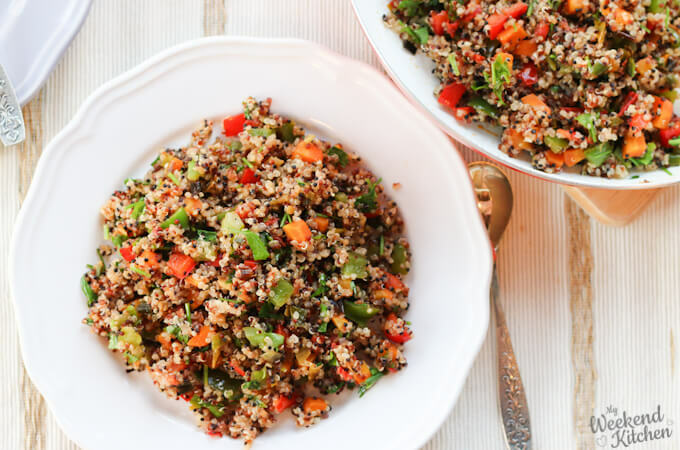 Healthy and delicious, this vegan stir fry with quinoa is loaded with vegetables and fresh flavors. Simple seasonal ingredients and ready in just under 30 mins, this vegetable stir fry recipe is a sure keeper! 1 cup mixed quinoa (150 g) you can use mixed quinoa or a single variety. Place the quinoa in a fine mesh colander and rinse it under running water. Quinoa seeds have a naturally occurring bitter coating called saponins which gives it a bitter flavor. Rinsing helps remove that. In a thick bottom pan, add the rinsed quinoa with double the amount of water and some salt. Remove from heat and let it stand covered for 5 minutes. When the oil is hot, add carrots. Sauté for 2 minutes. Add onions and bell pepper (capsicum). Mix well and sauté for another 2 minutes. Add salt, pepper, and the cooked quinoa. Mix well. Add fresh parsley and adjust seasoning to taste. *You will know that the quinoa is cooked when it is puffed up and you will see a curly little “tail” come out of each quinoa seed which is, in fact, the seed’s germ or bran. This tail that sprouts out when quinoa is perfectly cooked is super nutritious. 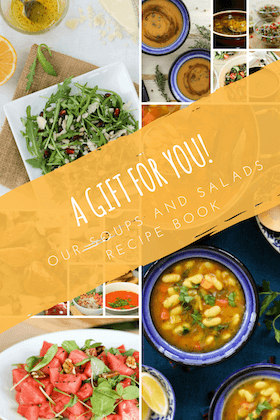 **All the vegetables are pan-sautéed but you can also roast some vegetables like sweet potato, beetroot, cauliflower, or broccoli in the oven and add for a different flavor. Nutritional Information is the approximate value of 1 serving.